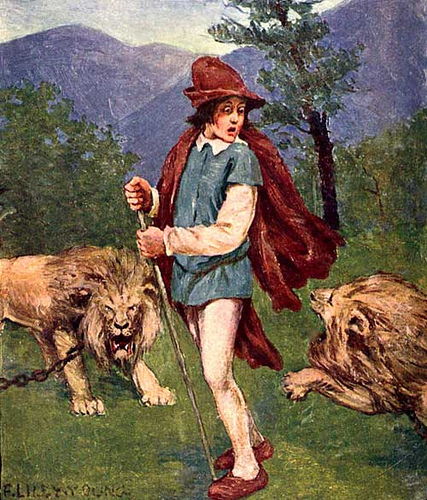 …Then I saw he went on, trembling for fear of the Lions, but taking good heed to the directions of the Porter; he heard them roar, but they did him no harm. In John Bunyan’s inspired allegorical tale, the Christian life is represented as a journey towards the Celestial City. A journey full of dangers, temptations, snares. In order to arrive finally at his destination the pilgrim, “Christian”, must face up to all of these and conquer them. He is not without aid, but his struggle is real. In the above quote he has to pass through a narrow ravine and it is getting dark. He sees two lions at either side of his path and they start to roar at him. He is terrified and stops in his tracks. But them a voice shouts out to him that he should not fear, keep to the centre of the path and no harm will come to him – the lions are chained. This is an important spiritual lesson for all Christians. Our lions are chained. Whatever danger, threat, worry assails us –all these are held in check and limited in action by God. He allows them for the testing and strengthening of our faith, not to do us harm. It is a great image – our lions are chained! As such, any halcyon days we do experience are to be treasured and enjoyed. They are momentary gracelets of respite, but they are not to be considered our normal fare; they will not last. This entry was posted in discipleship, Faith, pilgrimage, religion and spirituality and tagged Christianity, discipleship, Faith, John Bunyan, Pilgrim's Progress, Religion and Spirituality by fuelforpilgrims. Bookmark the permalink. Such a critical point to remember – thanks, Stephen.